Millions of Americans, including the US House Judiciary Committee, demand that Attorney General Barr release the Mueller Report to Congress and the public by April 2. Barr has said he'll release a redacted report by mid-April. MoveOn and Nobody Is Above the Law are assessing the situation to see if they will sponsor a National Day of Action on Thursday, April 4, including rallies nationwide. We will follow the lead of those groups as they monitor Attorney General Barr's actions and let you know as soon as we can if INCO will host a rally. 5 - 6 pm at 16th and Marine Drive, Astoria. We will send an ALERT email if we are holding a rally. "This is up to us - all of us. No one’s coming to save us. We’re going to have to save ourselves .... Change won’t come from the swamp -- it will come from us. If we want to defend democracy in this country, we’ve got to do it ourselves." Tell your Members of Congress to make the Mueller report public. Our democracy is on the line and Congress must obtain the Mueller report. The Barr letter is another example of obstruction and cannot stand. Call your Members of Congress and insist they do all they can to get the full Mueller report released. INCO's Astoria Community Group has outgrown our excellent space at Street 14, so we're moving! Please note the NEW TIME AND PLACE of our meetings. No purchase necessary. Please no outside food or drink. Our thanks to Micha, Jennifer, and the Street 14 staff for their gracious hospitality. Thanks to Rebecca Kraft for welcoming us to WineKraft! Help keep Seaside streets, beach, and parks free of single-use plastic bags. Seaside residents or Seaside business owners: Please sign this petition to support a ban on single-use plastic bags in Seaside. Communities across the state are working to ban these bags and encourage greater use of reusable bags. If you don’t live in Seaside or own a business there, please pass the link to the petition to Seaside residents and business owners. The petition with its signatures will be presented to the City Council and Mayor of Seaside. Thanks to INCO members, including Laura Allen, Joyce Hunt, Bebe Michel, and Kathleen Macdonald for their outstanding work on this important project. A few years ago, many people who are now INCO activists helped defeat liquefied natural gas (LNG) export terminals and pipelines proposed for the Columbia River. 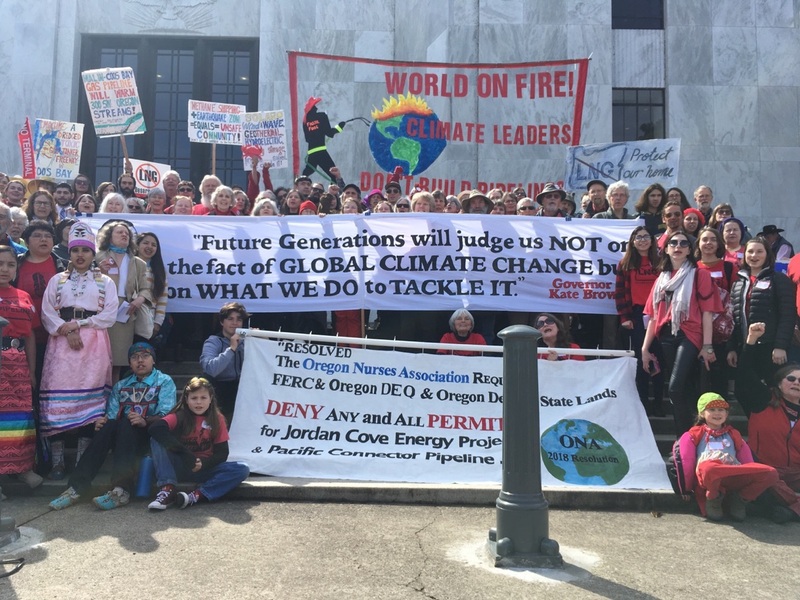 Last week more than 300 NO LNGers gathered in Salem for NO LNG Lobby Day on March 28 to protest the Jordan Cove LNG terminal and pipeline proposed for Coos Bay and southern Oregon. 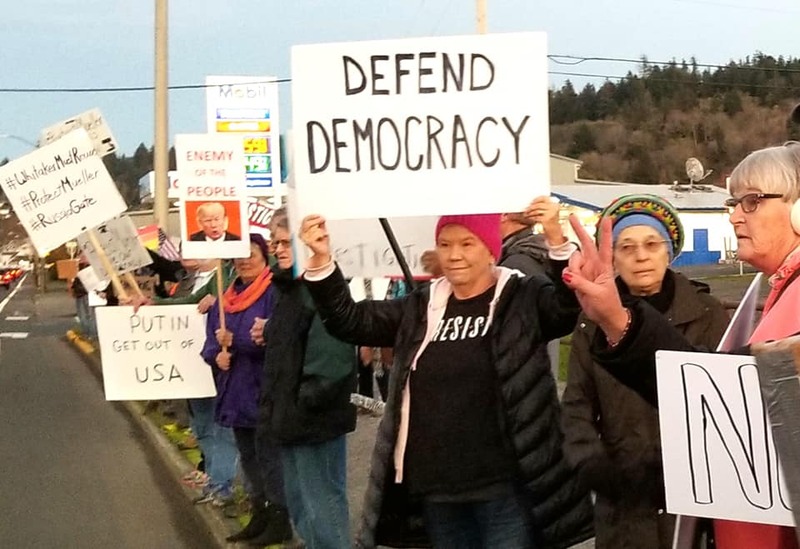 If you missed the OPB broadcast, we encourage you to listen to this Radiolab podcast for intriguing ideas for keeping democracy strong, especially when many Americans value it less than we do. Topics include people's beliefs about democracies, actual examples of ranked choice voting, and "Kumbaya" election campaigns. For news about more than 60 bills, go to the One Small Thing website, www.onesmallthingpdx.org and click on the Task Force button and then through to the “summary grids” link. There's also a button for you to see the bills that One Small Thing is supporting/opposing. For info on lobby days, hearing dates, town halls, click on the Oregon State Legislative Calendar on the website’s Home page. Clean Energy Jobs and Climate: Keep up the pressure on our legislators for the Clean Energy Jobs Bill (CEJ) HB 2020 by calling your state legislators each Monday through April 1. Link here to Renew Oregon and then click the RSVP. For those Mondays Renew will provide you a script with key benefits of CEJ HB 2020, and then you make the call. Check out Eric Halperin's article about Clean Energy Jobs in the March hipfish newspaper. National Popular Vote (NPV): Contact State Senator Betsy Johnson at 503-986-1716 or at Sen.BetsyJohnson@oregonlegislature.gov TODAY to urge her support for the National Popular Vote (NPV) bill. When enough states join this compact, their electoral votes would go to the Presidential candidate who receives the most popular votes in all 50 states and the District of Columbia. State Representative Tiffiny Mitchell is a long-time supporter of NPV. Gun sales and storage: Contact your state legislators if you want popular gun safety laws in Oregon. SB (Senate Bill) 275 and HB (House Bill) 2505 would require that that guns be safely secured. HB 2251 was introduced by Governor Kate Brown to require common-sense limits on gun ownership. After consulting with Mom's Demand Action and reviewing these bills, INCO'S Advocacy Team has endorsed these bills. Contact info is here.